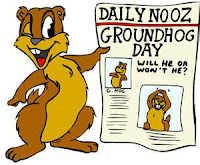 No groundhog news to report from the South End this year. Allen Street Al hasn't been seen since we got the dog - two years, now. But judging from the weather, Al has probably not seen his shadow wherever is residing these days, probably in one of our neighbor's backyards. Woo-hoo! Summer is just around the corner. In the days when the Roman Empire moved north into the territories of the Celtic and Germanic peoples, one of the cultural elements imposed on the native peoples was the solar-based Roman calendar. The Roman calendar timed the seasons of the year by observing the position of the sun, and placed the first day of each of the four seasons on the days of the solstices and equinoxes. Thus for them, the first day of winter was the winter solstice in December, and the first day of spring was the spring equinox in March. The solstices and equinoxes were their major religious holidays. The ancient northern Europeans used a lunar calendar, and measured the changing of the seasons by observing the stars. We're all familiar with Stonehenge and it's famous stellar alignments used to measure the seasons, but such devices were everywhere in ancient northern Europe and were used the same way. The Celtic and Germanic peoples reckoned the seasons to begin not on the solstices and equinoxes, but on the cross-quarter days roughly halfway between a solstice and equinox, in part because these days corresponded with the onset of seasonal weather changes in the four-season climate of northern Europe. These days were their major holidays, and they persist in our folklore as Halloween, Groundhog Day, May Day, and Lammas. This timing of the seasons is why Shakespeare's play about events on the summer solstice is called "A Midsummer Night's Dream". For us, the solstice is the first day of summer, but for ancient Britons, it was the middle of summer, which began on May Day. When measuring alignments of the stars and the position of the moon, one can look directly at them at night, but of course, one cannot look directly at the sun. Measuring the position of the sun with ancient instruments had to be done by observing the shadow the sun cast on devices like sundials. So, this is the meaning of the Groundhog Day legend. "If the groundhog sees its shadow, there'll be six more weeks of winter." In other words, if one reckons the seasons according to the solar calendar of the Romans, by observing the shadow cast on a sundial, the first day of spring is six weeks away, on the solstice in March. If one reckons the seasons in the old way, by observation of the stars at night using the ancient calendar devices, then the cross-quarter day in early February is the first day of spring and winter is over.